Atlantis, The Palm Hotel and Resort is a luxury resort located at the apex of the Palm Jumeirah in the United Arab Emirates. 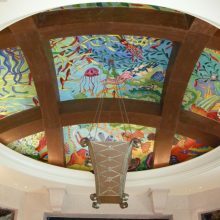 The hotel is themed on the myth of Atlantis, but with distinct Arabian elements. 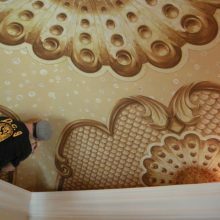 EverGreene was contracted to create and install all the Atlantis Hotel and Resort’s murals throughout their premier suites, lobbies, restaurants, and hallways, totaling over 25,000 square-feet of mural work. 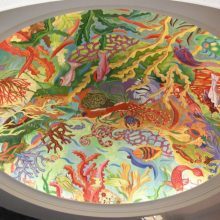 In EverGreene’s New York Design Studio, 24 murals were designed and translated the original flat digital designs to effectively fit into complex three-dimensional round domes where they would be ultimately be installed. 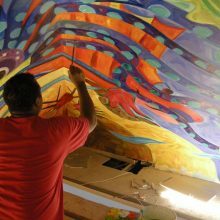 EverGreene’s Mural Studio hand painted the murals, many of which were painted in pieces and strips, then in-painted on site post installation, for a seamless effect.